You’ll see from my previous review that I had high hopes for this season finale. It never had to play out the way I was hoping it would, just in some kind of entertaining and coherent way, but the episode was neither of those things. We start mid-cyber invasion, the Doctor is perplexed and the Mistress is phenomenal, playing up that the Cybermen are just performance actors and goading the Doctor. In the meantime, Clara is pretending to be the Doctor in order to buy herself some time with the Cybermen who have found her and are trying to kill her. It’s very entertaining and she’s very good at it, I actually got super excited when I saw her eyes come up in the into credits instead of Capaldi’s! But it was a ruse entirely, once again demonstrating her expert lying skills. The strange beginning of the previous episode was nothing more than poor characterisation. In a surprise to absolutely nobody, Danny becomes Cyber-Danny and ends up saving Clara from her predicament. A woman you see, no matter how smart, cannot save herself. Meanwhile, out in the street, U.N.I.T show up. I was so excited to finally have them in a season that seemed like they should have been peppered throughout. 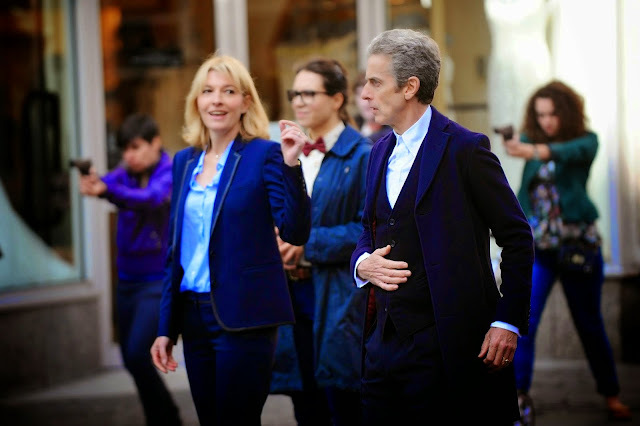 It was wonderful to have Osgood and Kate Lethbridge-Stewart back. The Cybermen seem to have system improvements (in much the same way that the Daleks did in the first season) and can fly away. Here’s where things get truly stupid. The Cybermen explode in the sky and become the massive black clouds. As the Doctor ponders this, himself and Missy and drugged and taken away by U.N.I.T. When the Doctor awakens, he is informed by Kate that the world now has a President; the Doctor. They are aboard an aeroplane and awaiting his command. The Doctor gesticulates about the clouds, declaring to all the fools around him (and they really did seem foolish) that it was CYBER POLLEN. Yes, Peter Capaldi said that with a straight face and I legit smacked myself in my own. 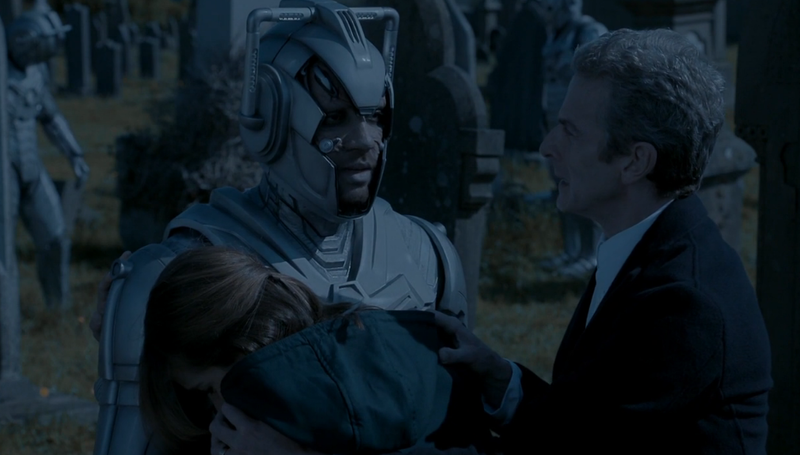 The Cyber Pollen was seeping into graves and converting the dead into Cybermen. Now, while I think turning the dead into an army is a fantastic notion, it’s certainly been done before and this was not the most convincing way to do it. It felt completely ridiculous rather than menacing. Meanwhile, Osgood is working at a bench near the captive Missy. She tells the Doctor that everyone is looking at the graves and not at the clouds, why are those still in the sky? Perhaps we should be looking up. The Doctor essentially invites her to travel with him and this is the point where I squeak with delight! I should have known that given she’s a non-companion woman (although that doesn’t protect anyone in the Moffat era) she’d be coming to some kind of harm in the near future. 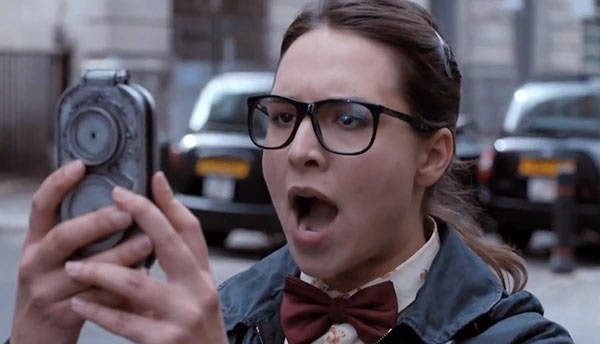 With some ceremony, Missy escapes and kills Osgood, another woman brought back just to be killed off to raise the dramatic tension. Cybermen begin to pull the aircraft that the Doctor and Co. is on apart in the sky. Missy chides the Doctor and threatens him, pushing Kate out of the plane to raise the stakes even more (what a surprise). It is revealed, as Clara calls the TARDIS, that it was Missy who was driving the Doctor and Clara together all this time, it was her who gave Clara the Doctor’s number in the first place and who placed the advertisement in the paper at the beginning of the season. Why is still beyond me, but given this is yet another one of Moffat’s elaborate schemes, I’m sure it’ll take many further hours of watching to decipher, and I just don’t think I care anymore. The Doctor rushes to Clara who is trying to help Cyber Danny turn off his emotions. 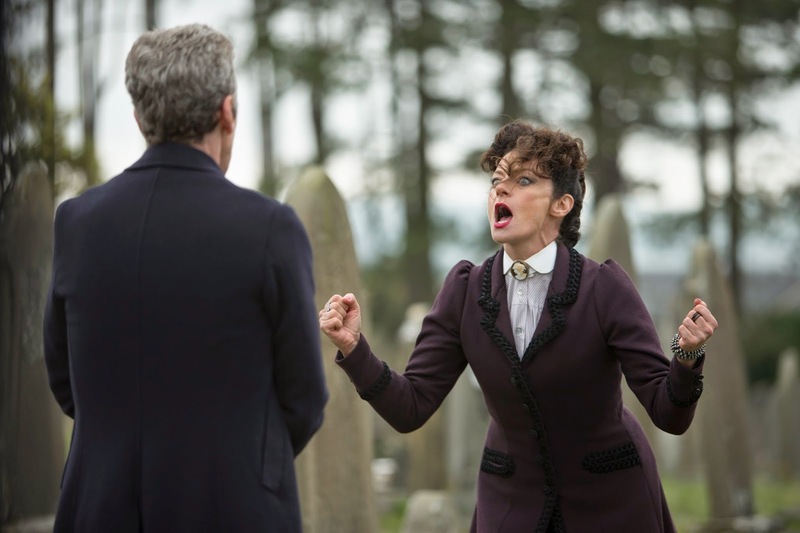 I should note here that Clara goes on a massive impassioned speech about how she would never turn on the Doctor, and it’s the most convincing thing I’ve seen her do all season. It ties perfectly with the girl who jumped into his time stream to save him. Too bad that it’s either a lie or, because Clara is a woman and clearly whimsical, means nothing, because the second Clara realises it’s Danny she goes to jelly again. We are once again made to believe (well not very well) that he’s the man she loves, when you know, it really doesn’t seem like it. Danny doesn’t want to feel this way, and continues to bang on about the Doctor being an Officer. 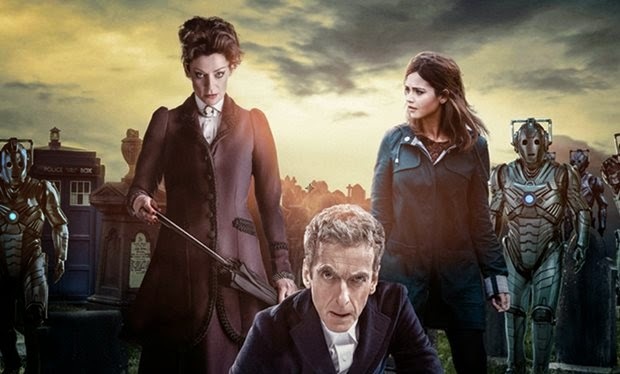 Clara uses the sonic screwdriver to delete Danny’s emotions and in the process he tells the Doctor that the clouds are still there because Missy plans to convert the entire human race into Cybermen. Missy arrives and does the only truly interesting thing in the whole episode, she demonstrates her control over this new Cyberman army, how she can make them do whatever she commands using her bracelet. And then she slaps it onto the Doctor’s wrist and tells him that this army is his. It was all for him. She doesn’t need an army because she doesn’t believe she is always right. The Doctor seems to be torn, given a human army and a cyber army all in one day, and again questions who he is. For all the build up, the answer isn’t anything to write home about, the Doctor realising he’s just an idiot, a daft old man with a box who likes to help when he can. It’s still pretty good though. He gives control to Cyber Danny who takes his army into the sky to self-destruct and to therefore burn away the cyber pollen clouds. Missy asks the Doctor if she can come with him, telling him the coordinates of Gallifrey and saying she wants her friend back. This emotional turn, and the flavour of it throughout this episode, is particularly perturbing. Like now that the Master is a woman she’s more in touch with her emotional need for the Doctor. Urgh. Clara has other plans and threatens to kill Missy, telling the Doctor that he let this creature live in the past and that all the death and destruction she caused is on him if he lets her live again. The Doctor asks to do this himself, to save Clara the blood on her hands, but at the last minute a Cyberman appears and kills Missy. On the ground the Doctor and Clara discover Kate Lethbridge-Stewart, seemingly caught from the fall to her death by… her cyber-dad. Why? So that the Doctor can salute the Brigadier in a bro-bonding moment. In the night, Clara hears Danny calling to her and when a bright light appears, she believes he is coming back. Apparently, due to some unexplainable reason, the bracelet that Missy was using to control the Cybermen can bring one person back to life. Eye-roll. Anyway, he sends back the little boy who he killed in the war because he is such a good dude and leaves Clara to take care of finding the boy a family and a home. Clara and the Doctor finally catch up (about two weeks later) to discuss where to now. Despite all their previous talk about not lying to each other, they end their partnership on a lie. The Doctor assumes that Clara and Danny are back together – that Danny had made it back through that heavenly vortex thingy. And to make her feel less bad about stopping travelling with him, the Doctor says that Missy didn’t lie about Gallifrey and that he’s going back there to live. Why Clara would believe that is beyond me, you know, given she knows him so well, but we see the Doctor go to the coordinates and find nothing but empty space, he’s distraught and angry. His lie leads Clara to lie about Danny and tell him that she hopes he has a good life there before sadly seeing him off and walking into a crowd. It’s all very nothing, very square one and very much like we spent a season with a Doctor and companion who not only don’t trust each other, but who haven’t grown and developed their relationship. This is made worse by the fact that this companion was best friends with a previous incarnation and is the one companion who has apparently met all of the Doctors and knows him better and loves him more than anyone else. Really, that’s the only word I can use to describe season 8 of Doctor Who, a complete illegible mess with a smattering of confusion and disappointment. Most other reviews I have read or seen (which I do after writing this), have all tried very hard to say – ‘the season wasn’t very good but let’s look at the positives! Maybe other seasons had just as many low points! Think of how good Capaldi is!’ but it’s like everyone is trying to make excuses for their favourite show not being quite right. They don’t want to admit now lacklustre it actually is, especially not with someone as magnificent as Peter Capaldi heading it up, but the truth is, I wouldn’t watch any of those episode again, and I frequently re-watch Doctor Who episodes. I’m not really sure where this leaves me. I am actually not one for reading any spoilers for shows that I love and watch, but I feel like I need to go read everything I can about the Christmas special to decide whether it’s worth continuing. The fact that Nick Frost is playing Santa Claus is a major draw card, but I kind of feel like I am caught in a destructive loop with this and that until some major changes happen, I won’t love the show the way I used to. I actually think the writers and crew of the series are struggling with the older Doctor far more than they would like to admit. They’ve written young for so long that they don’t have the skills to make him a brooding old man who’s a bit of a loon and a bit of a grandfather but also a little dark and angry. They’re certainly not utilising Peter Capaldi well and unfortunately, he’s still not the Doctor for me at the end of this season. There was no reason for him being not quite right this whole time, or none that has been revealed, it’s just poor writing and it’s disappointing. Capaldi was a perfect casting choice and a perfect person to play the Doctor, and I just don’t think it’s really working. I can’t see Clara being done. That ending was too unresolved compared to the other companion exists. Surely they have to clear the air before parting ways, and I definitely think it’s time to part ways. We need someone new to give Capaldi a chance and I really thought having someone like Osgood would have been really nice, even for a short while. I think they blew an opportunity there. Having the Doctor companion with someone we’ve already met is still a great idea and works really well. A lot of people I have talked to, and I agree with this as well, think that the next companion should not be a nice young 21st Century woman. Why can’t she be old? Why can’t she be an alien? Why can’t she be from another time?